Thanks to the amazing array of barrel-aged brews and hearty ales available in December, many of us are growing bellies that even the man at the North Pole would be proud of. While many of us don our own red hats and honor the big man with our own gift-giving exploits, it feels like Santa might be extra stressed this year for a myriad of people-produced reasons. I’m sure Santa still appreciates a good batch of cookies and a tall glass of milk, but this year, I think Mr. Claus might appreciate something with more of a bite to quell his nerves during the big night. Here’s a look at six beers that are sure to put you on the nice list with Santa Claus this year. Christmas Ale | Great Lakes Brewing Co. This beer literally has Santa Claus lined up around the block for the release. Well, at least people dressed up as Santa that is. Cleveland’s Great Lakes Brewing Co. is known for many delicious beers but their idyllic Christmas Ale surely brings the most holiday cheer – along with a massive release party that leaves many people merry. 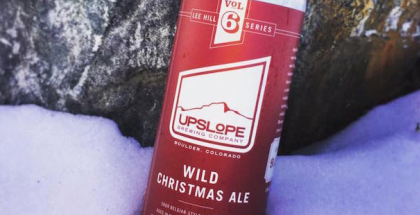 Their award-winning ale pairs a nice, toasty body with a delicious hit of decadent spice that has made this winter ale the leader of Christmas Ales for some time. Oh, and if you really want to leave Santa warm and fuzzy, they have a barrel-aged version too. Sometimes, Santa just wants a beer version of his milk and cookies staple, and the newest collaboration beer from the award-winning Hailstorm Brewing and Open Bottle does just that. Now in its third year, the limited edition Santa’s Cookies and Milk Stout takes its inspiration from the delicious cookies left out for Santa each Christmas Eve, coupled with the creaminess of a sweet milk stout. The latest edition is mirrored after a Samoa Girl Scout cookie and brings beer drinkers the familiar flavors of coconuts, vanilla and a bit of chocolate. To ensure you get on Santa’s good side, $1 from each bottle sold will go to Tinley Wish, a local nonprofit. Interested in cutting the decadence of the cookie beer with a bit of cinnamon spice? The Gingerbread Man brown ale from Strange Craft will also do the trick, no cooking required. For those who dream about more than sugar plums. Shiner Holiday Cheer is back and looking more festive than ever. Texas favorite Shiner Brewing doesn’t typically experience snow, but they definitely brew a beer that is more than fit for wintry conditions and sleigh rides. First brewed in 2010, their Holiday Cheer brew is an old-world Dunkelweizen made with Texas peaches and roasted pecans. Cheer has an admittedly different flavor composition than the traditional spices you’d find in a Christmas beer but its unique combo of sweet and salty is sure to stand out on Santa’s palette. Maybe you’ll even get a few extra presents. XOCOVEZA Mocha Stout | Stone Brewing Co. Taking a beer from another warm climate, Stone’s bright XOCOVEZA imperial stout is as flavorful as it’s label is colorful. Inspired by a delicious cup of Mexican hot chocolate, XOCOVEZA brings together delicious notes of coffee, chocolate with a bit of pepper kick that makes this beer stand out from its colleagues. The rich, creaminess of the chocolate delivers the main flavor punch of this mocha stout, but it’s the quick hits of pepper and coffee bean that will serve as a solid pick-me-up for a taxed Santa Claus. Winter Ale | Alaskan Brewing Co.
It’s not the North Pole, but Alaskan’s premiere craft brewery sure knows how to craft a delicious Christmas-inspired concoction that is sure to make any North Pole citizen proud. Brewed to be an English-style Old Ale, Alaskan’s winter seasonal balances a hearty malt bill with a rich dose of spruce tips and hops, making it more bitter than sweet. After trying stouts made with cookies and chocolate, a nice burst of bitterness might be a welcome sign for Mr. Claus. Sierra Nevada has been extra good year this year and deserves to get celebrated a bit. Alongside the awesome rollout of their Resilience IPA to help with the damage from the Camp Fire wildfires, the esteemed Californian brewer continues to roll out classic beers that hark back to the old days of craft while also still representing some of the best beer styles in today’s increasingly competitive market. Sierra Nevada’s Celebration IPA is perhaps the premier example of that. Bursting with the freshest Centennial, Cascade and Chinook hops available, Celebration proves that some of the best IPAs can be brewed outside of summer and should be celebrated alongside a cozy fireplace and a heap of well-wrapped presents. And if Santa gets sick of delicious Christmas stouts, IPAs and winter ales, a smart way to satisfy Santa’s taste buds and elevate the traditional chocolate chip cookie is by adding in a bit of your favorite whiskey – like Woodford Reserve – in place of the traditional vanilla. You’ll still get the sweetness but with an added bit of warmth and bite to the traditionally decadent cookie. I’m sure Santa will drive his sleigh responsibly. I’d honestly bet the elves have engineered an autonomous, self-driving sleigh by now that can drive itself so Santa can better focus on holiday cheer for all to hear. Here’s hoping you have a great one. Cheers! I received some samples of the items featured here for review purposes.